WASHINGTON (AllPolitics, Feb. 21) -- Whitewater prosecutor Kenneth Starr, backtracking in the face of intense pressure, announced Friday he will stay on until the Whitewater probe and any resulting prosecutions are "substantially completed." Starr, who had planned to become dean of a Southern California law school effective Aug. 1, said he made an error in judgment in announcing he would step aside before the Whitewater probe was wrapped up. "As Fiorello LaGuardia would say, 'When I make a mistake it's a beaut,'" Starr told reporters, quoting the late New York City mayor. "I try not to make mistakes," Starr added. "I do make mistakes, but it is an example, by the way, of I've learned my own lesson: the importance of the deliberative process that I have been trumpeting." Starr came under intense, immediate criticism on Monday, as soon as he announced he would become dean of Pepperdine University's School of Law on Aug. 1. The harsh reaction from friends as well as foes across the country may have caused him to rethink his departure, but Starr attributed his change of heart more to conversations with colleagues in his office. Starr told reporters he had thought the investigation was at the stage, with a professional, dedicated staff in place, that he could discharge his duties and still report to Pepperdine for the start of the school's academic year. "It should not be the role of one individual," Starr said. "That, I think, is a dangerous thing." But his decision was wrong, Starr said. "It retrospect, it was a mistake for me to set an arbitrary date on which I would conclude my duties as independent counsel," he said. He described himself as "personally humbled" and said he didn't consult enough with his colleagues before he made his decision. "I think there was a fairly broad-based sense [in his office] that I had made a mistake," he said. Starr, 50, mentioned the outside pressure only once, referring apparently to a letter from Sen. Arlen Specter (R-Pa.) urging him to stay on. Specter wrote Starr to say his departure was being interpreted as "a sign that the issues will not be pursued with the same diligence." Some of the outside pressure came in the form of newspaper editorials, accusing him of prematurely abandoning his government-paid assignment for a plum job in Malibu, Calif.
"Accordingly, I have informed Pepperdine University that I intend to continue as independent counsel and will assume no duties or responsibilities as dean at Pepperdine until the investigation and any resulting prosecutions of persons named in the order appointing me as independent counsel, or high-level government officials, have been substantially completed," he said. Starr said Pepperdine University officials have agreed to the delay, and he expressed regret that his earlier announcement might have called into question his commitment to completing the three-year-old, $20 million Whitewater probe. "My commitment is to the people and to the pursuit of the truth," Starr said. "As we say frequently, we want the facts." 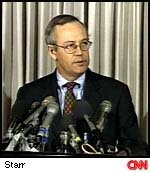 Starr would not comment on the substance of the investigation, or whether he was close to making any decision about whether to charge President Bill Clinton or first lady Hillary Rodham Clinton with crimes. There was no immediate comment from the White House, which also had no official reaction to Starr's earlier announcement he was leaving.